So, you’ve just got your first banjo and you’re super stoked to play it. You bring it home, take it out of its hard shell case, put your picks on and start making some noise. And then it happens. You realize it’s loud. Really loud. It doesn’t take long for you to realize that if you intend to keep your wife/family/roommates/neighbors from murdering you, you’ll have to quiet the thing down. And fast. 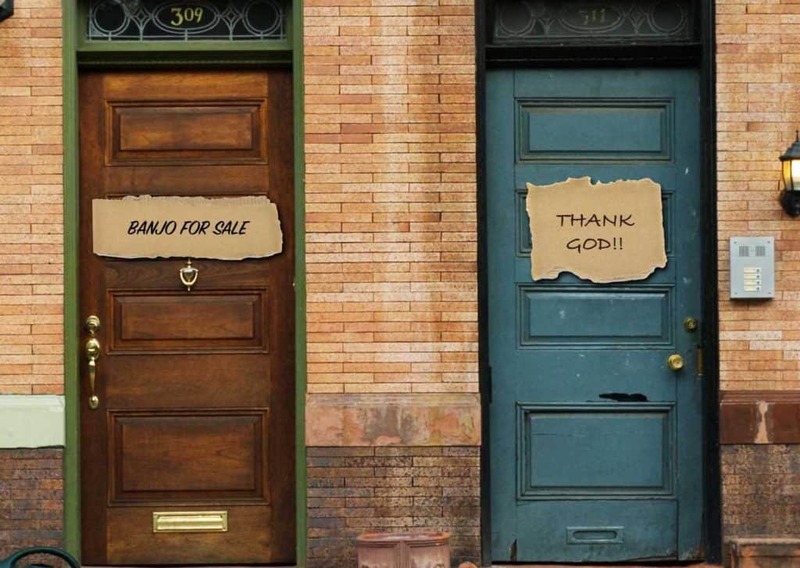 Faced with this scenario, most new banjo players resort to a solution which, on the surface, seems the most logical – they practice without fingerpicks. A more advisable way of quieting your banjo is to use a banjo mute. Banjo mutes are an affordable, hassle-free and practical way of reducing your banjo’s volume. 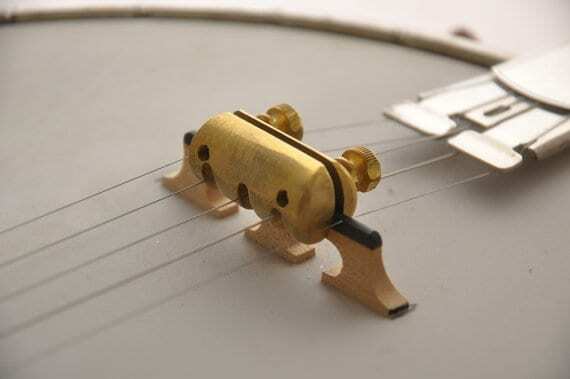 Compact and easy to use, they usually attach to the banjo’s bridge. There are an assortment of banjo mutes out there at your disposal, ranging in price from about from $15 to $25. 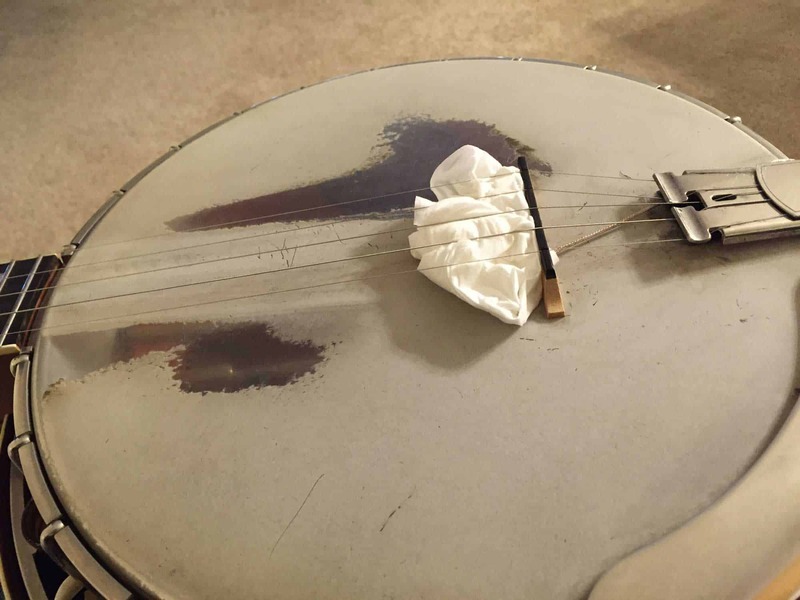 Of course, there is another way of quieting your banjo without having to fork up the moolah for a banjo mute – tissue paper! Not to put the manufacturers of banjo mutes out of business, but I personally prefer the tissue method as it allows you to adjust the amount of muting you’ll require. Simply ball up a little bit of tissue/toilet paper and insert it underneath the strings immediately to the left of the bridge (assuming you’re in playing position looking down at the banjo head). Make sure you don’t use too much paper or you’ll deaden the strings completely. You’ll probably need to play around with this a little before determining exactly how much tissue you’ll need. One sheet of tissue paper is usually ample. For added muting, you can always stuff a balled up rag, sock or shirt between the banjo head and the truss rod. The truss rod is the metal bar that, on open-back banjos, can be found by turning the banjo over on its back side. For banjos with resonators, you’ll need to remove the resonator to get to the truss rod. I don’t recommend using the rag/sock/shirt method by itself as it generally doesn’t provide enough muting on its own. And there you have it! All the different (and most effective) ways of muting your banjo in a nutshell! Have fun tomorrow morning at your 4 AM practice session!